Microsoft's stock reacted violently to the Q4 results announcement last week, by shedding more than 11% of its value. Microsoft missed revenue and earnings estimates by a wide margin and took a $900 million charge for Surface RT inventory. While most analysts and media houses have focused on this writedown, the overall state of Microsoft's PC business may be far worse. 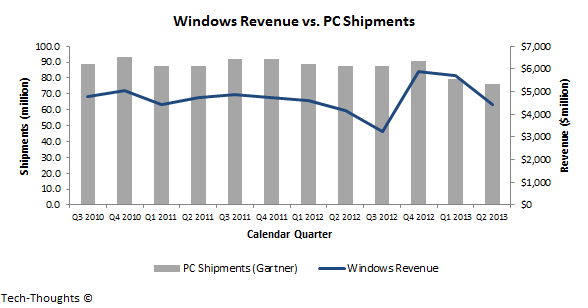 The chart above shows the revenues & operating margins of Microsoft's Windows division. As we can see, both revenue & operating margin saw a steep sequential decline in Q4. 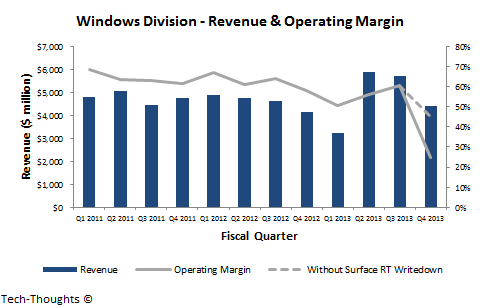 Even if we ignore the Surface RT inventory writedown, Windows operating margin declined to just 45%, its lowest level in more than three years. Microsoft admitted that results were affected by weak growth in the enterprise PC market, combined with a sharp decline in the consumer PC market. This shouldn't really come as a surprise to most readers, but seems to have taken some analysts off guard, given Microsoft's relatively strong Q3. As I had explained previously, Microsoft had attempted to "hide" weak PC performance, using one-time enterprise volume discounts - which weren't sustainable. Given the continuing weakness in the PC industry, Microsoft's financial performance is likely to take a turn for the worse over the few years. Microsoft is aware of this trend and is attempting to reorganize from a divisional to a functional, i.e. vertically integrated structure. However, this comes at a time when the industry is moving towards a modular structure, creating significant challenges for integrated companies like Apple & Samsung. Microsoft may also use the reorganization as an excuse to stop reporting divisional revenue, which may hide the weakening performance of the Windows division. However, this is unlikely to fool investors anymore. At this point, shareholder activism becomes the best hope for shareholders and the biggest risk for Microsoft's board & executive team. UPDATE: Updated the post/charts to exclude deferred income from the Windows Upgrade offer, Windows Phone & patent related revenue. Pending the reorganization, Windows Phone is still part of Microsoft's Entertainment & Devices division, while deferred revenue from the Windows Upgrade offer expired last quarter.